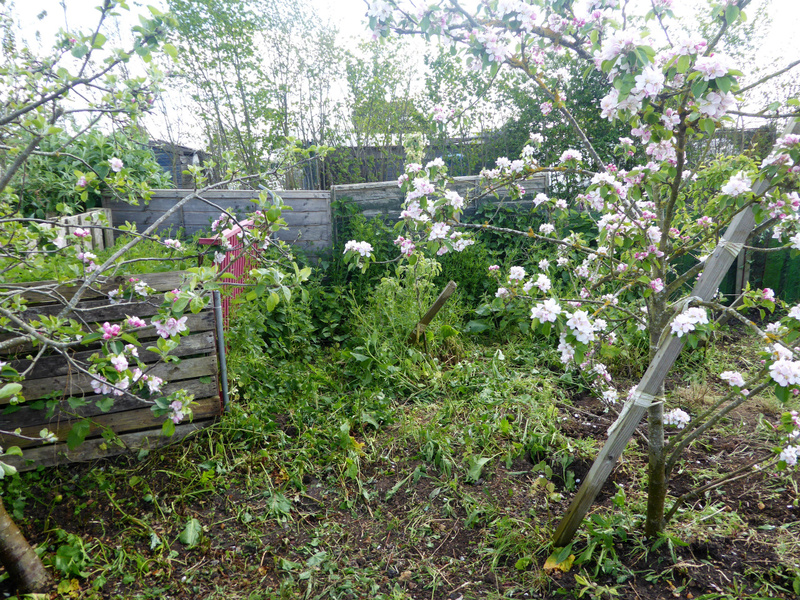 With no polytunnel to build or play in, we have been able to tackle a huge project this week, which we were both dreading: the clearance of our little orchard area on #145. 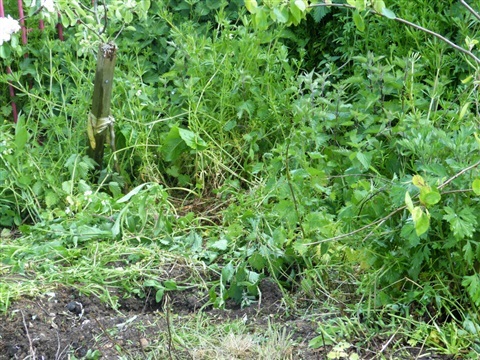 We had had grand plans of this being a wild flower meadow, but the rich soil - this used to be a manure pile several years back - was not best suited to the meadow flowers we had envisaged, and these rapidly became overwhelmed by thug-like docks, thistles and nettles. 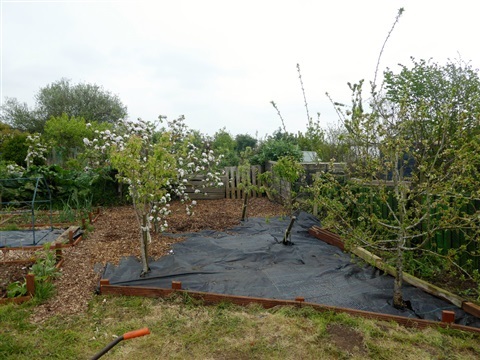 Keeping these under control is beyond us really, and so they have been cut right down and the whole area covered by heavy duty landscape membrane topped by around 10cm of woodchip. 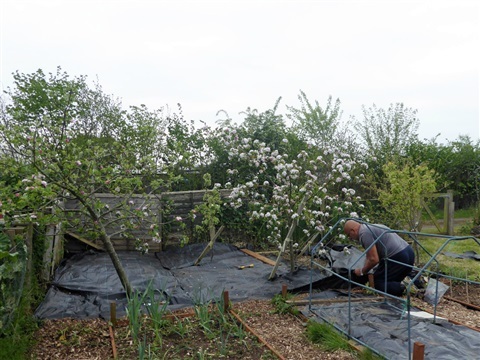 Given that the weeds in the area we covered for the tunnels died completely, we feel optimistic that with a little care around the gaps for the tree trunks, WeedsRUs will be closed for good! We transported woodchip in large builders' trugs, 8 at a time in the car. Much quicker than barrowing it round from the main gate to the plot! And then, after 37 trugs full of chippings, the membrane was completely covered and ran seamlessly with the top path. Abi put in some wooden edging to stop the woodchip from falling onto the grass area by the gate, and ... job done!! 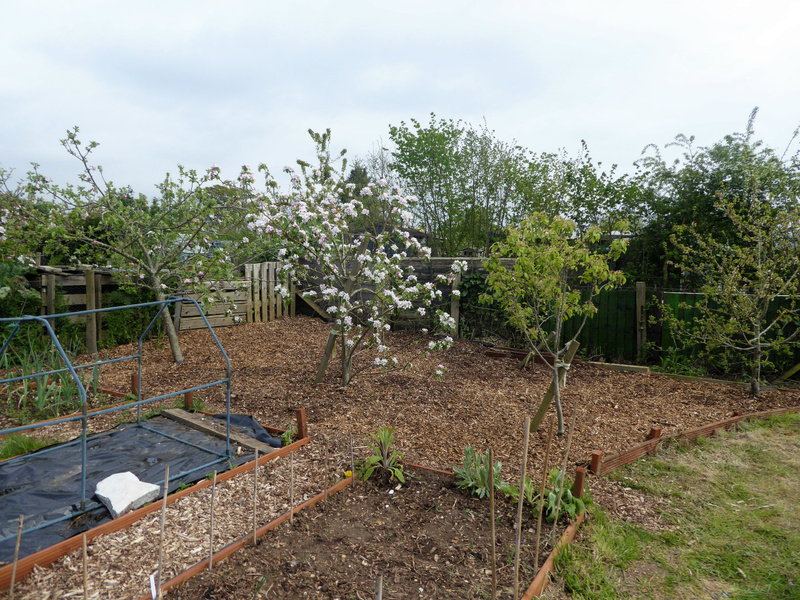 It makes the whole plot look much more spacious, and it is great to be able to see the smaller trees properly. They should grow better without being choked by weeds around their roots too. 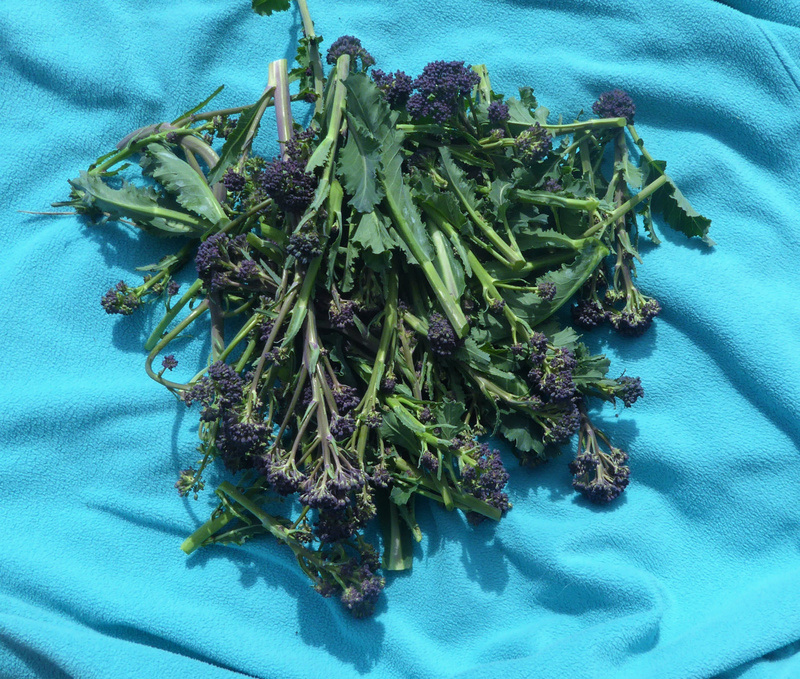 Harvests this week haven't always been photographed for "Harvest Monday" but Purple Sprouting Broccoli is still busy producing lovely spears (Which, by the way, I have discovered keep really fresh for more than a week in a bowl in the fridge, loosely covered with cling film) These pickings have been steamed as a side vegetable and used in stir fries. Not many more weeks to go so we are making the most of it while we can. 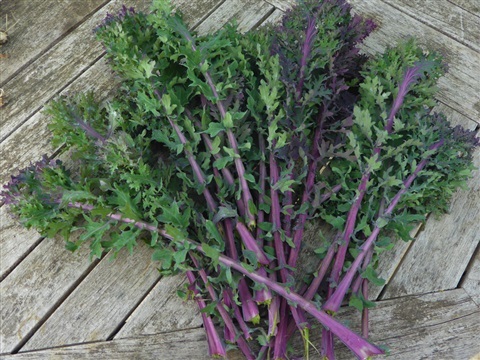 The Raggedy Jack Kale gave us one more meal before the plants became chicken food, and the Red Mustard is nearing its end as well: I can see flowering stalks developing, which I shall cut out to slice and eat, in the hope we get another couple of weeks out of the plants. 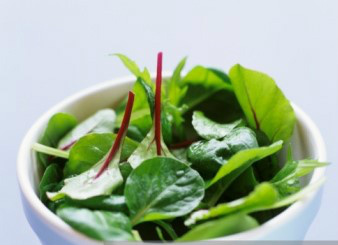 The same is true of the Perpetual Spinach, and I might freeze some, cooked down, in ice cube trays. I'll let you know how this goes. The Mustard leaves went very well with spicy meatballs and rice! 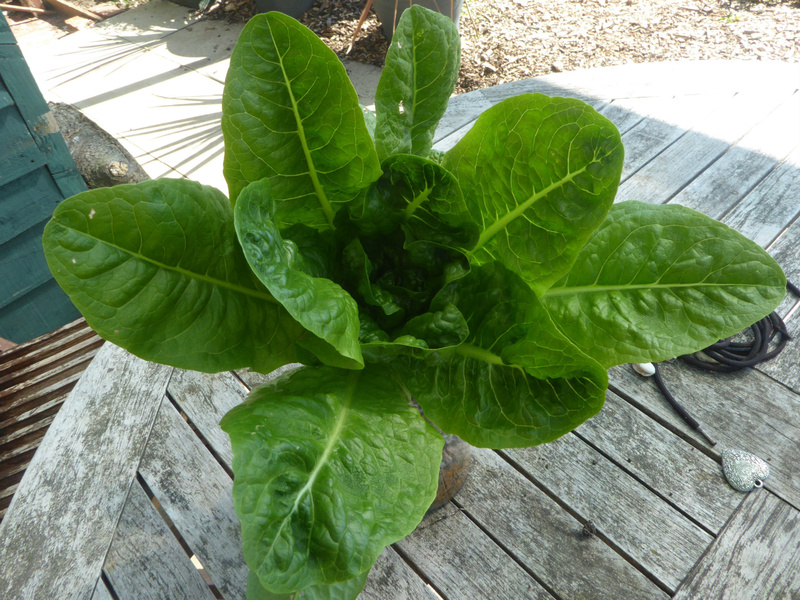 Also on the table was this soft and sweet tasting frilly green lettuce, one of the last from the late Autumn planting. A few more radishes made it home, too. The plants that are left look less inclined to develop plump roots, despite heavy thinning, so they might find themselves in the compost before long. 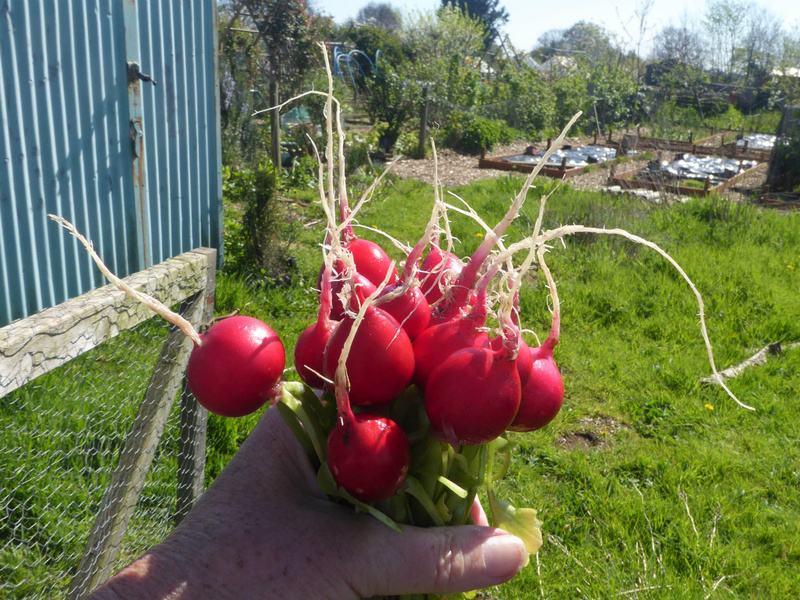 The next crop of radishes was sown along with the parsnips, and has already germinated, so we shan't be without any to eat for too long. 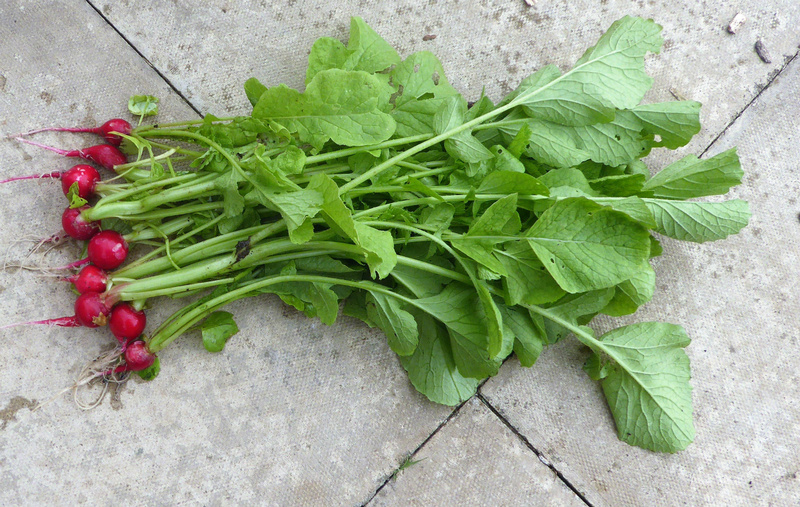 The parsnips ar not up yet of course: they are their usual tardy selves. I had three small seed potatoes hanging around, so these were been duly planted today, although the bag will not be living in the greenhouse for three more months!! And that is the end of our harvests for this week. 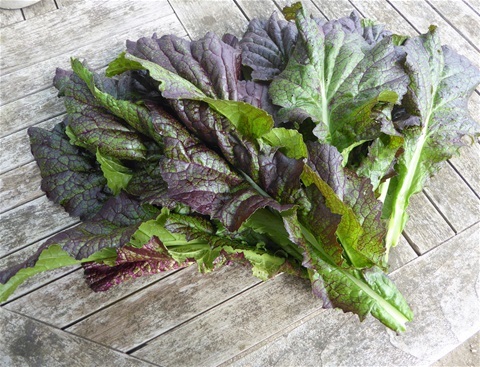 Have a look at what others have harvested, in the link at the end, hosted by Dave. Not quite sure how we have found time time, but there has been a fair bit of digging going on. The compost bin we have been filling is now full to overflowing with chopped weeds and shredded paper, bulging up under the cover, so it was time to empty one of the others. 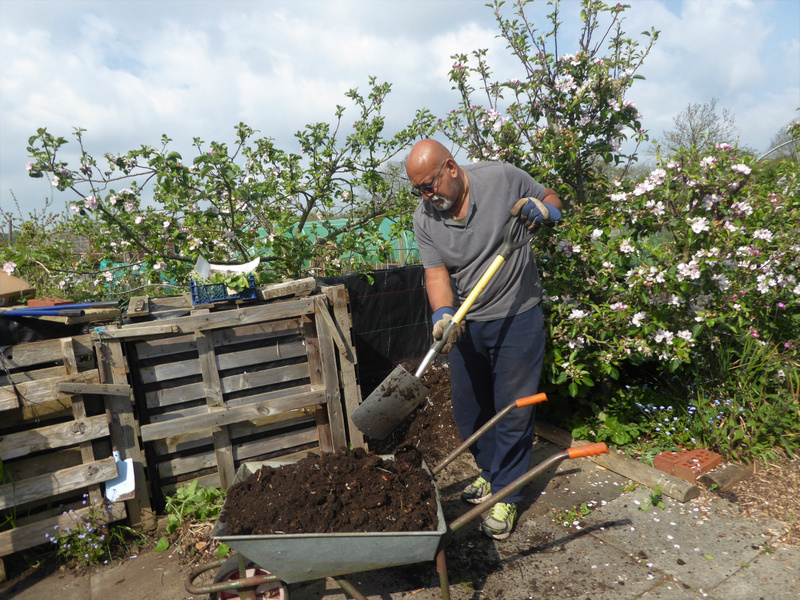 It is always a wonderful moment, to stand back and appreciate the miracle that is compost, as the front comes off the bin. It is just soft weeds, the kitchen waste, shredded paper, torn up egg boxes and the odd sprinkle of soil to keep up the bacterial activity that ends up as this beautiful, dark brown, crumbly stuff. The original cubic metre of vegetable matter rotted down to about a third of a bin, which is still quite a lot of compost to shift. Lots of this bin load went to the potato beds on #145, as it has become increasingly difficult to protect the new growth from night time frosts through earthing up, so some extra dressing to the tops of the beds was very welcome. 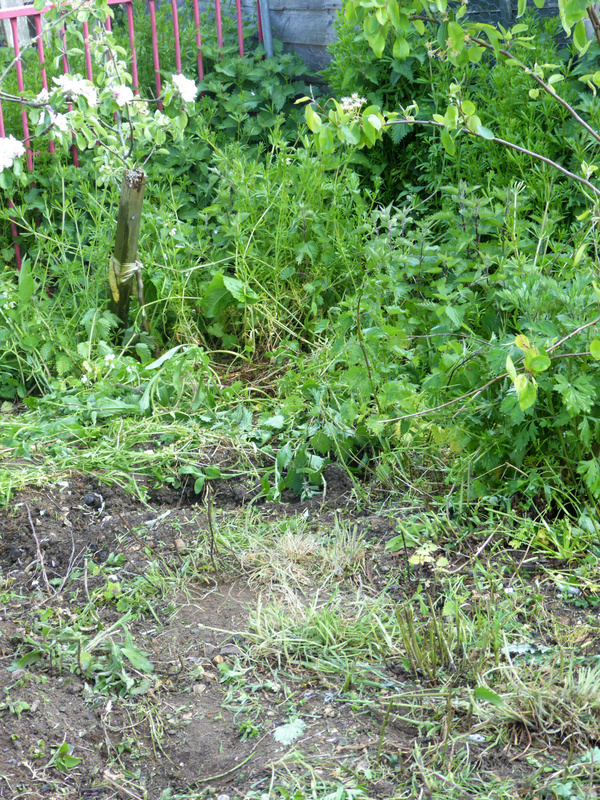 The rest was dug into the bed where swede and kale plants were then set out, as there seemed to be a distinct lack of organic matter there. Looks a bit better now! 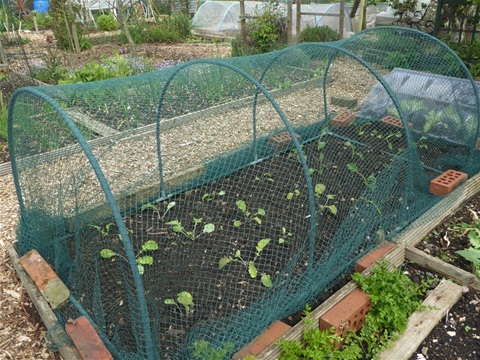 This net is not butterfly proof, but will do for now to repel pigeons. 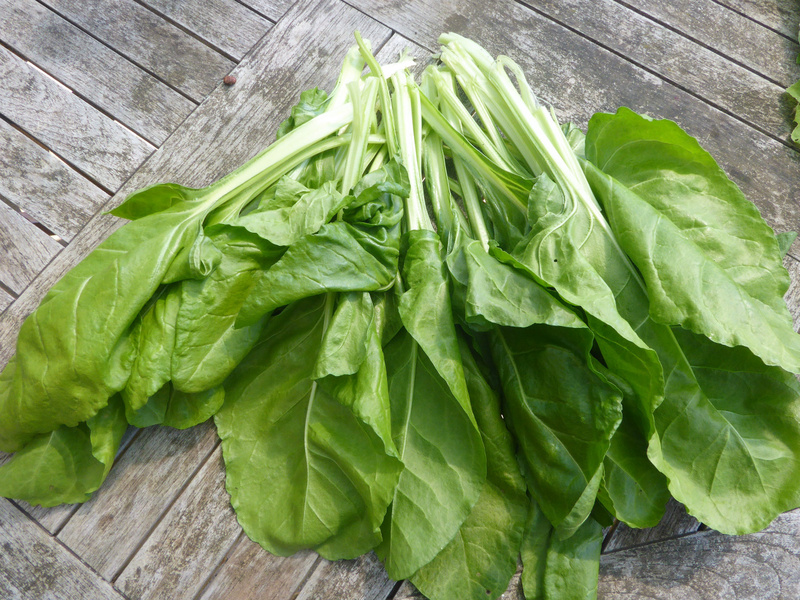 I have never ever had any success growing swede, so I am using all the advice I have been given by people who have managed to grow edible roots. A light dressing of Blood, Fish & Bone, five or six chicken manure pellets in each hole before planting, plant up to the crown of the plant and firm well. They survived their first night, so keep those positive thoughts coming, please; there is a long way to go yet! And the last job for this week past was to dig over the bed where the runner beans will grow and erect the support for them. Plenty of manure already added, so there was no need to dig a trench and fill with compost etc as I have done in other years. 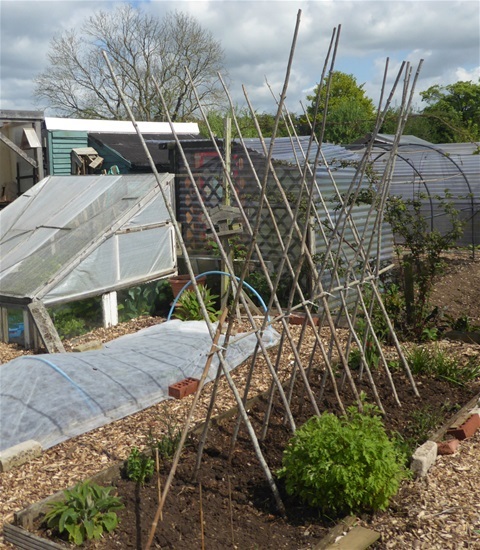 Last year, the design of the tradition A-frame led to plants getting very congested at the top, towards the end of the season, and pods getting caught up in the tangle of foliage and distorting. So... this year I am trying a more open frame, as you can see here. Key to its stability are the short canes acting as braces at each end. Without these, the whole structure sways alarmingly. In the background you can see the bed planted up with first early potatoes, covered with fleece as protection against frost damage. The sub zero temperatures forecast for the next few nights could wreak havoc with the newly grown stems and leaves, and they are too tall to earth up further. 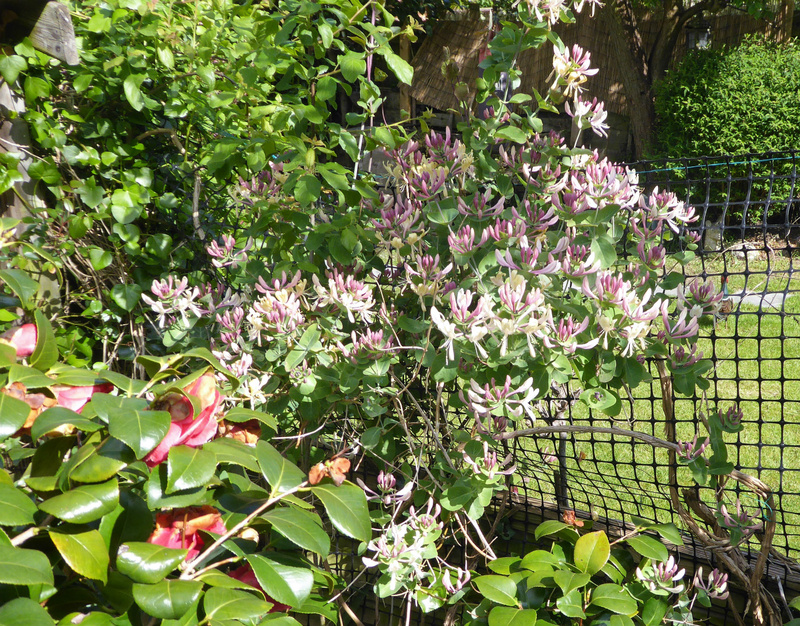 As always, there are some new flowers that have opened this week, and the one I enjoy the most is honeysuckle. 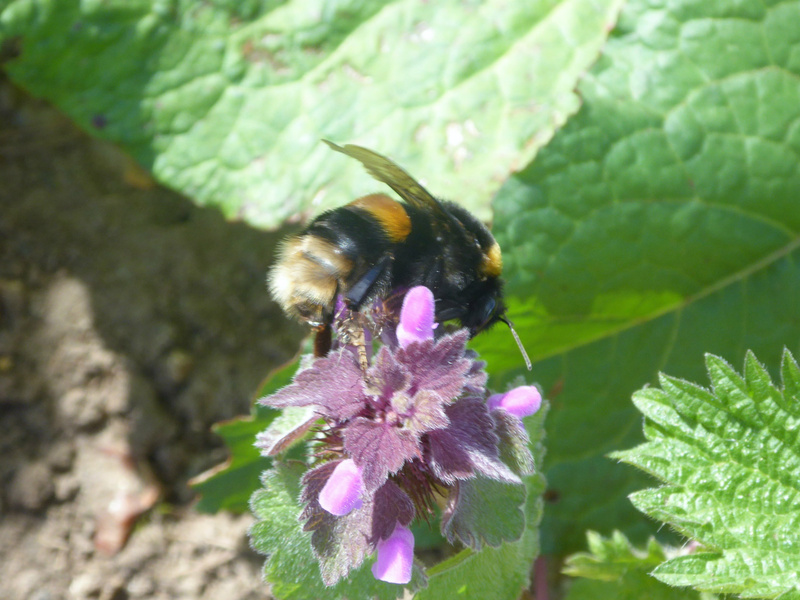 We have several varieties that flower in different seasons, and the bees adore them all. On a warm evening the scent of the flowers wafts across quite long distances for us to enjoy too. Mind you, the evenings are far from warm right now, so you need to get up close the sniff the flowers to appreciate their distinctive perfume. Thank you for reading the blog this week, and I hope there have been some bits of interest, or even dare I say, of some help too. 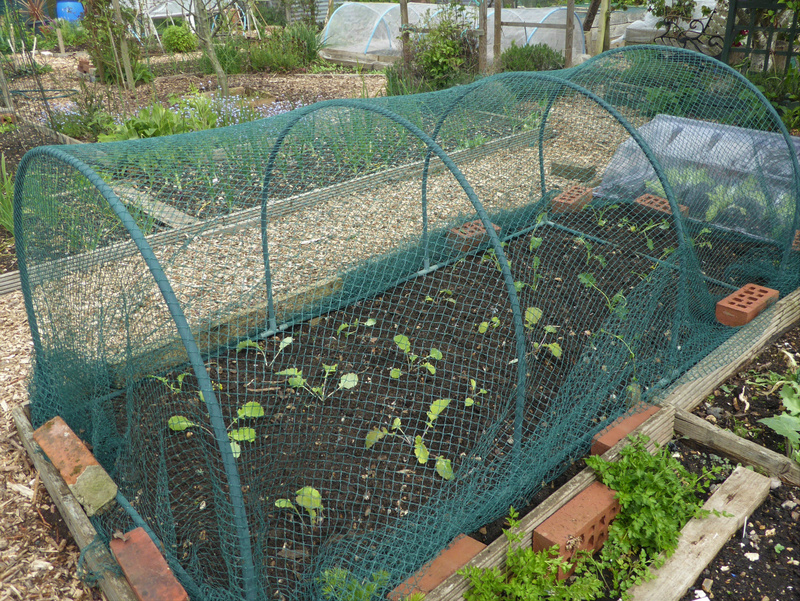 Next along the production line will be runner and french beans, and squashes. The tomatoes and cucumbers need potting on, as do zinnias, asters and African marigolds. Who knows where these will all go? A plan will no doubt develop somehow...at least I hope so!! 17th April - Fast and furious on every front! We have hardly stopped to draw breath this week, what with digging, planting, sowing, potting on etc. A bit of a disappointment as our chosen polytunnel is out of stock for the next month, and nothing else even comes close, so... as Mum told me so often, patience is a virtue, Kathryn, and there is nothing to be gained from railing against something that you cannot change. Gives us time to do other things though, which at such a busy time, could be seen as positive. I'm going to start with Harvest Monday, which is still hosted by Dave from Our Happy Acres over in the US. A great way to see what everyone else is eating around now too. LInk is on the last page. 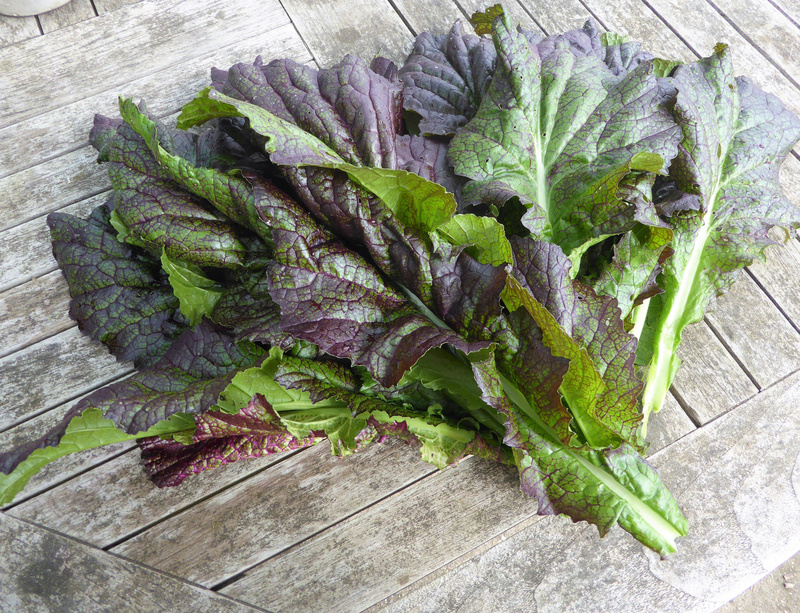 Next is another long standing friend: Raggedy Jack Kale. 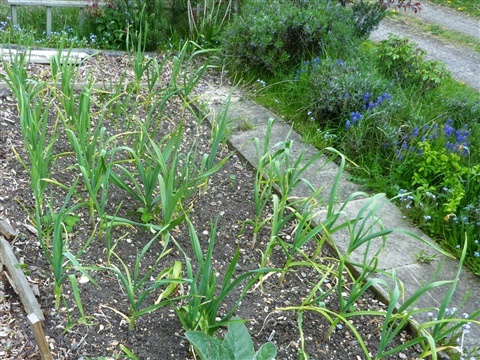 This is now just beginning to throw up flowering shoots, which are also edible, but is a sign that the plants will not be productive for very much longer. 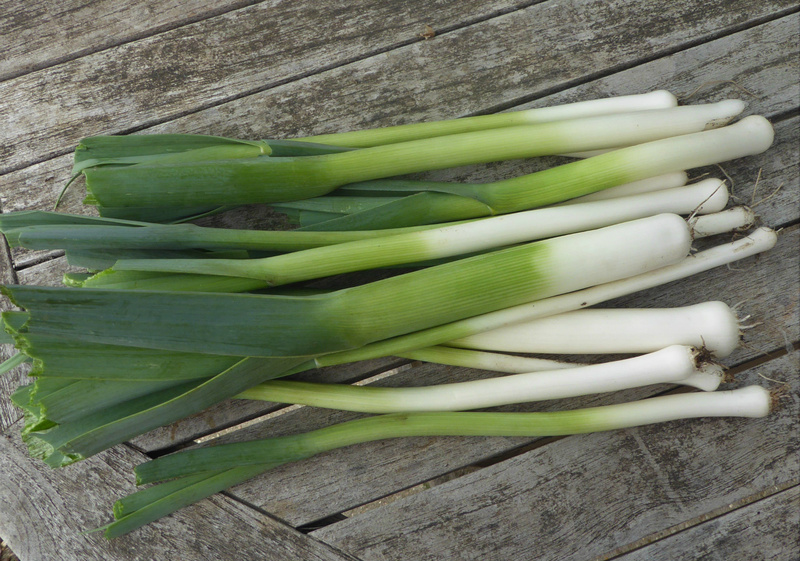 This week however, it went together with the last of our leeks as a side dish with beef casserole and mashed potatoes flavoured with chives. 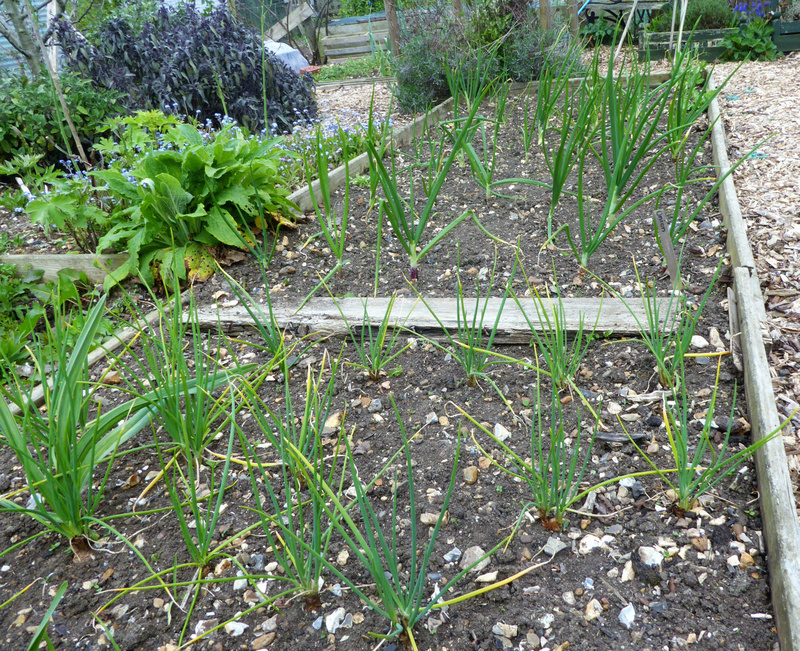 I forgot to take a photo of the chives, which taste beautifully fresh at this time in the year. 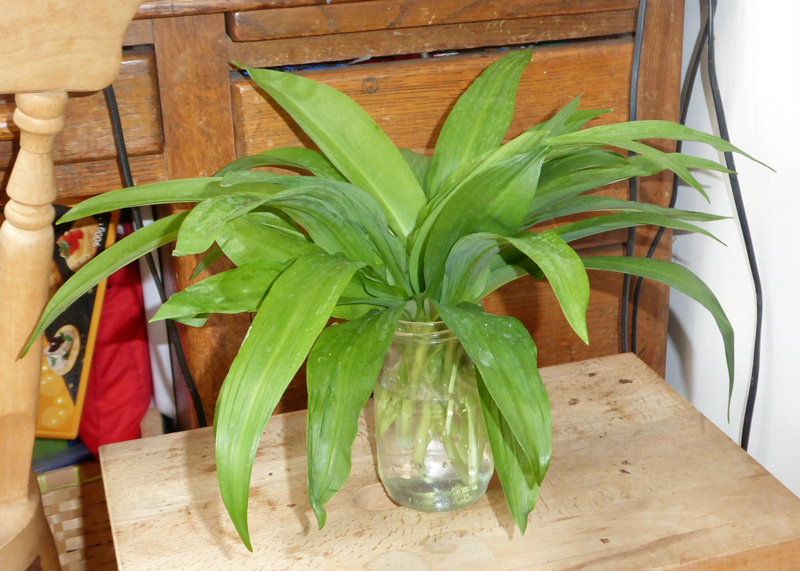 The Wild Garlic has multiplied enormously over the past three years and at last there is enough to be able to make generous pickings of the leaves. Cheese and Wild Garlic scones were easily made and just as easily eaten too!! I'll post the recipe tomorrow in case anyone else fancies making some. They are totally scrummy warm from the oven. The amount in the photo is just over the 30g needed for the scones, with the thicker part of the stems cut off, as I thought they might be a bit tough. 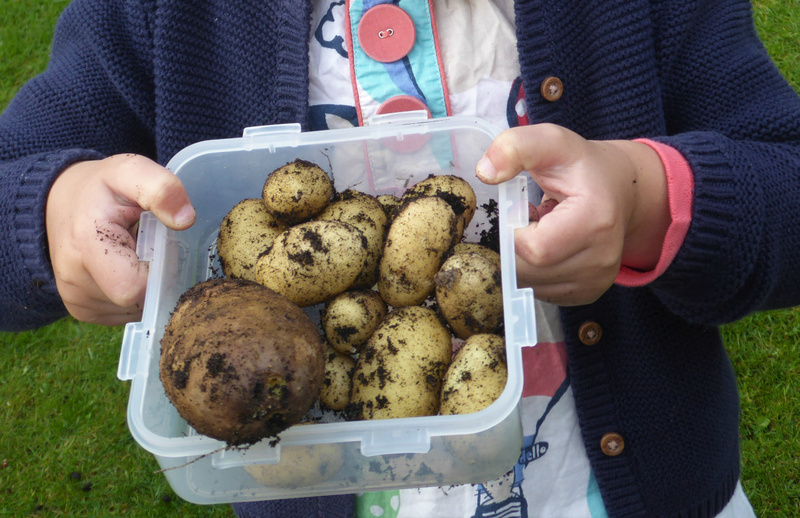 That is the end of our rather limited harvest this week. 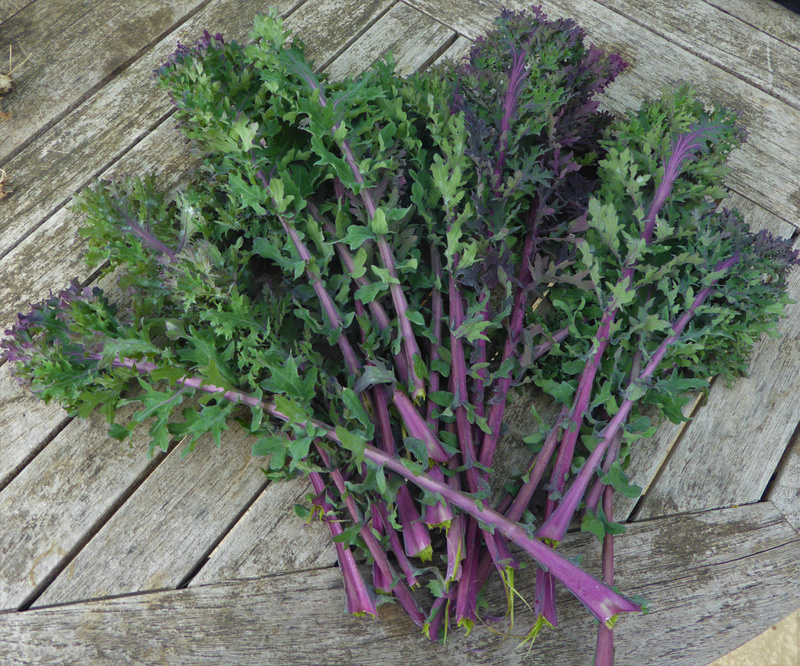 Moving on to sowing: I have already mentioned Purple Sprouting Broccoli, but if we are to be able to harvest these tasty spears next year, now is the time to sow the seeds. It takes nearly a year to grow to maturity, which, if you remember that the spears are immature flower heads, makes sense: plants have to be mature before they prepare for flowering. Seeds have been duly sown, 1cm deep, in a pot of compost, and the pot sat on the floor of the greenhouse, where it is not too warm and I can keep an eye on it to make sure it doesn't dry out. 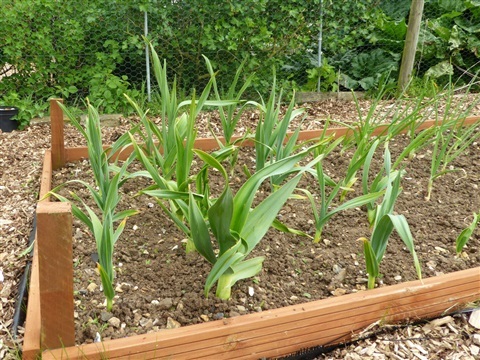 The plants are completely hardy however, and do not need any extra heat to either germinate or grow. As soon as they poke their heads up, I shall put the pot out on our bonsai bench so that they seedlings have enough light but are not in full sun all day... helps avoid the compost drying out... and once they have three or four proper leaves, replant them into individual 9cm pots. These will go to the coldframe to grow on. 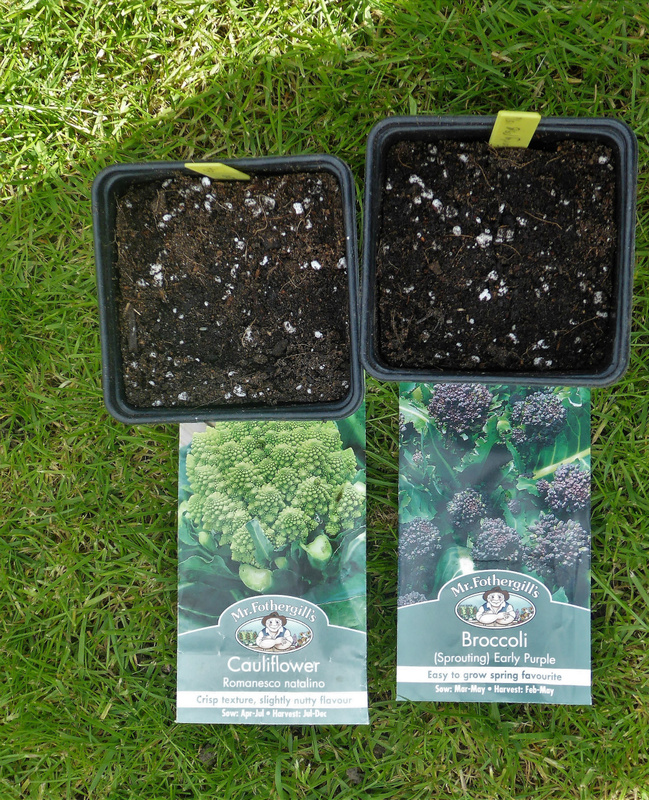 I found a forgotten packet of Romanesco cauliflower in the box, so decided to sow some of these at the same time. I daresay I can squeeze a few plants in alongside the broccoli! 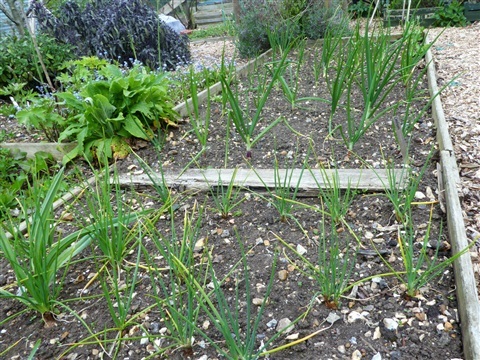 Now that the ground is warm, direct sowings on the open beds have a good chance of germination. Parsnip seed, variety White Gem, is now in the bed prepared for it: lots of stones were removed from the soil, Blood, Fish & Bone added two weeks ago and the seed drills well watered and lined with potting compost. The seeds were covered about 1cm deep with this compost too, as hopefully then the surface will not dry into a hard "pan", preventing seedlings from being trapped underneath. I thought I had some seed tape, but couldn't find it: must have been mistaken. I sowed some radish seeds about 30cm apart aalong the drills too, as these will germinate fairly quickly and show where the rows of parsnips are. 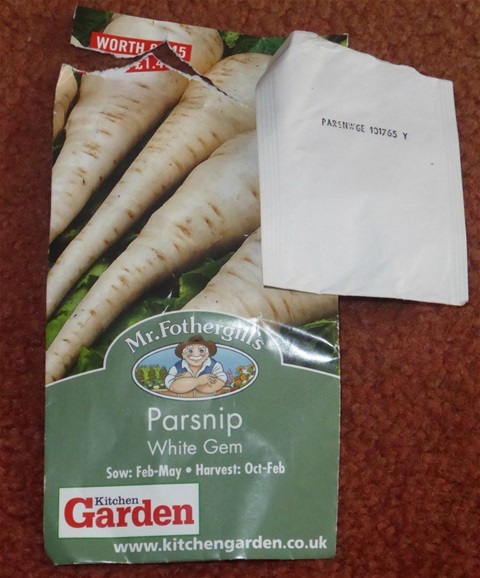 Parsnip seeds germinate very slowly and knowing exactly where they are helps with weeding, as the emerging seedlings are not accidentally pulled up. The wheels have come off the carefully drawn up plan for crops that need to be grown under cover. This week the chilli, sweet pepper and aubergine plants should have been able to be planted out in the new polytunnel, the arrival of which has of course been delayed. 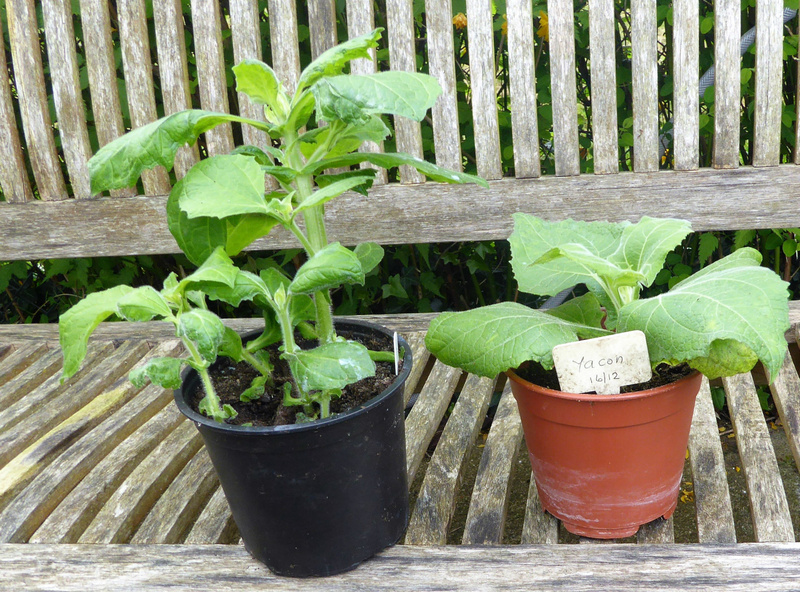 The plants needed moving into larger pots, and there is just not enough space for these, along with the tomato and cucumber seedlings that had to come out of the propagator as soon as their heads were above ground. The repotted plants have all started growing rapidly, so I hope that once the next few nights of sub-zero temperatures are over, I can move at least the sweet peppers to the large coldframe at the plot. You can see from this view along one of the sides of the greenhouse how close together the pots now are. Aphids flourish in this warm environment, so daily leaf inspections are vital to avoid a major outbreak. 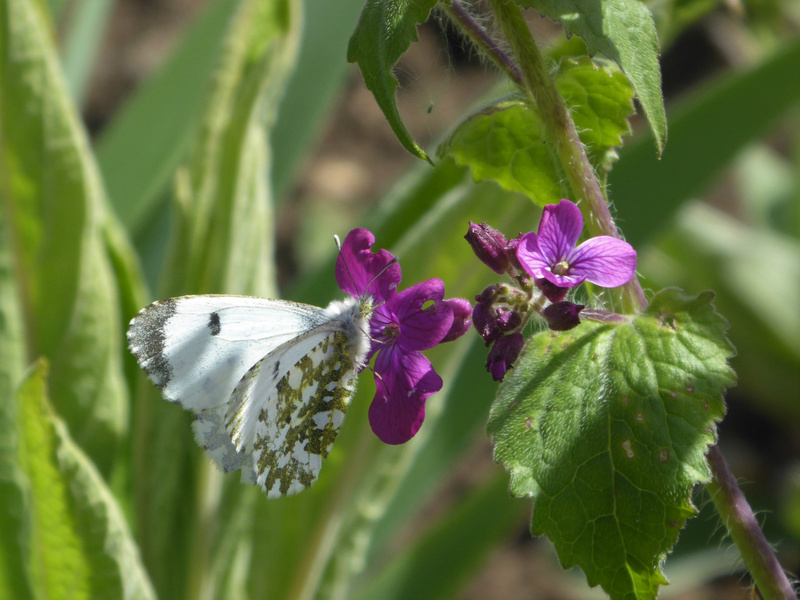 They even manage to live on the hairy leaves of plants such as Yacon. Just a quick note about Yacon here, as I have had a couple of people asking how they are getting on. This is two of the plants, and yes, they do need potting on again as the roots are showing through the holes in the bottom. Aphids love them, and I have to have daily "squish" sessions. I have read a lot during this week about other people's experiences in growing these and will definitely be keeping them in large pots, or I shall never be able to dig the tubers up from our heaavy ground in the Autumn without damaging them! 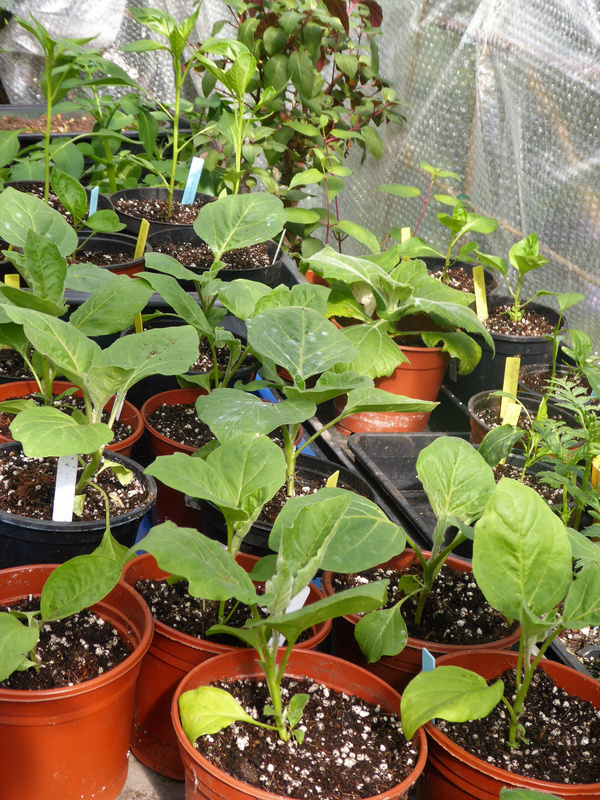 Module-sown mangetout are now in the greenhouse, safe from the attention of mice and voles, who will happily eat the seeds if they are sown directly in the ground. Once the seedlings are about an inch tall they will go to the coldframe at the plot to grow on until they are large enough to plant out. Last year the pigeons wreaked havoc with the plants and the crop was poor: a new strategy this year will hopefully improve matters. The structure can be seen here. Strings tied across from one side to another will stop pigeons from nibbling at the plants ... I hope!! 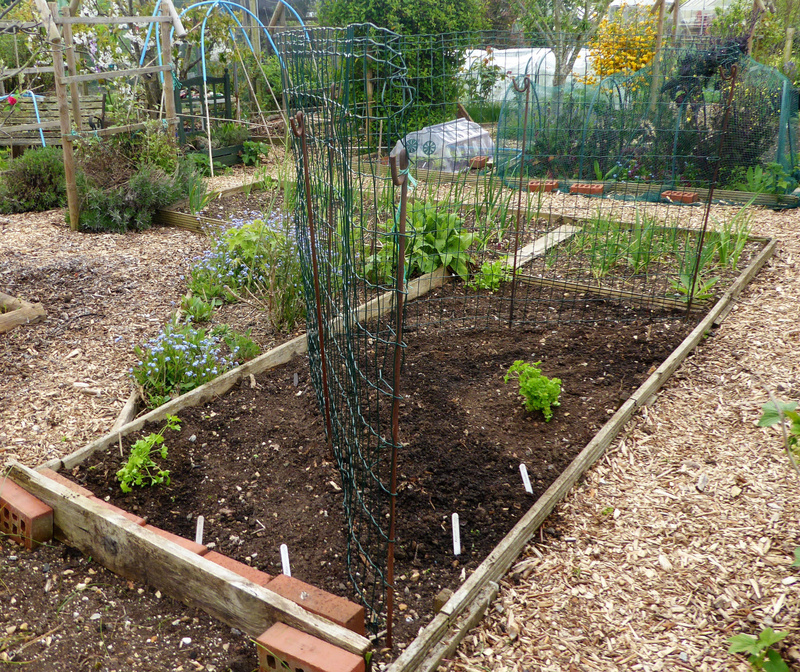 The spaces either side of the wire have rows of beetroot (Boltardy and Chiogga) with dwarf Calendula, blue Love-in-the-mist and parsely plants, which should grow into an attractive mix during the next couple of months. We saw the oddest thing this week. 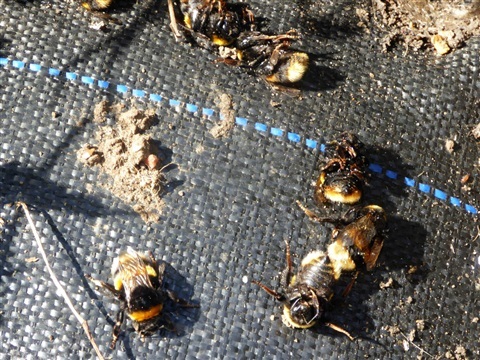 Underneath an old plastic pot, part buried in a heap of soil, were several bumblebees, and all except for one were dead. This single bee could hardly move, so I transferred it onto some flowers in the sunshine. Poor thing was starving and it took ages before she had the strength to fly. I'd like to think we saved her life and she has gone on the nest successfully, but we shall never really know. 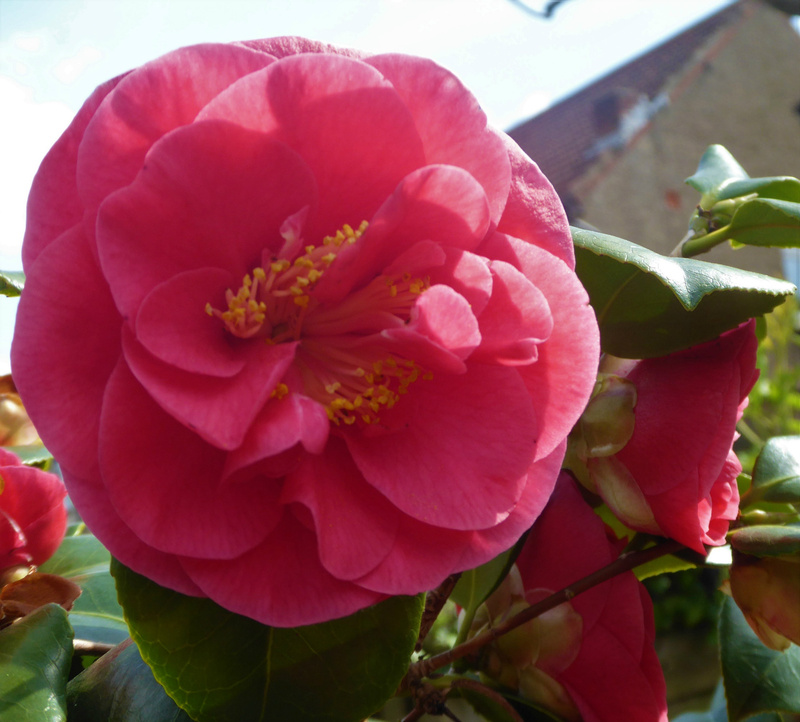 The large white camellia bush in our garden is now past its best, although the dark pink one is still going strong... just look at the header photo! But as one flower fades, another comes into its glory, and this week's glory comes from the lilacs. 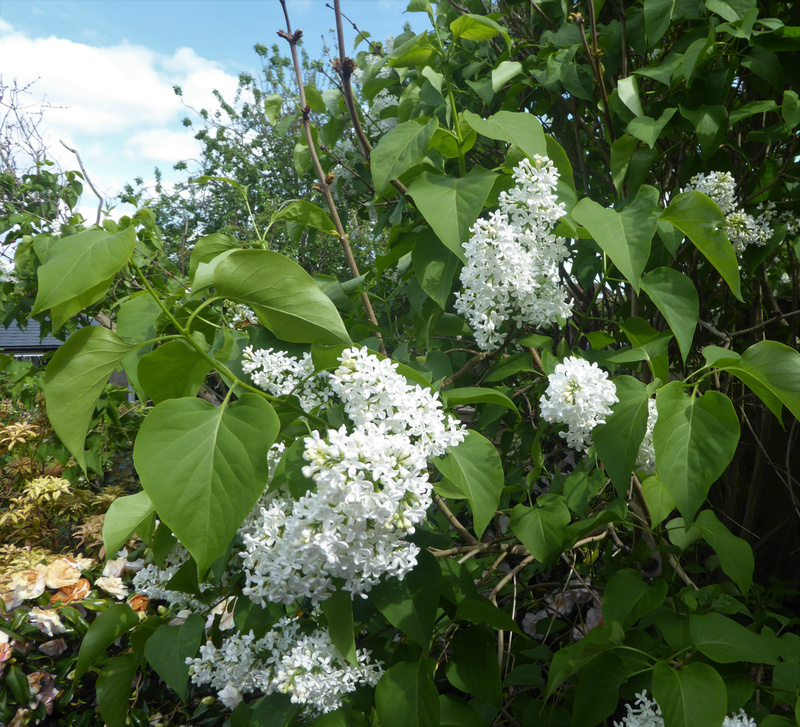 There is a large tree near our back door, and the scent of these flowers is sweet and strong in the sunshine. There is a purple variety further down the garden, but these flowers, although very pretty, are not perfumed like the white ones. In days gone by it was considered unlucky to cut lilac flowers and take them indoors, allegedly because their sweet scent lured the wild and unpredictable faerie folk to follow. They were feared and beliefs that they kidnapped people and took them off to faerie realms, never to return, became linked to the idea that lilacs indoors foretold a death in the family. 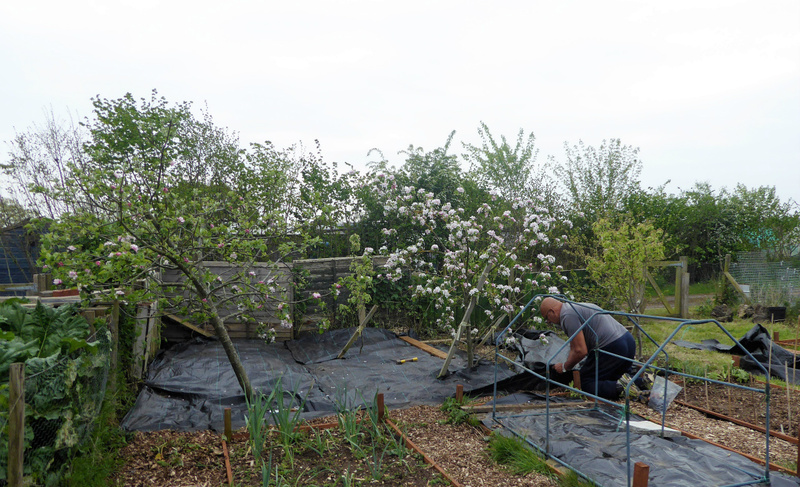 On that slightly surreal note, I shall end this week's blog entry, but will be back next week, with news of how we plan to manage our orchard area. 10th April - It's all in the planning! This year's sowing and planting plan has had to take into account our absences from home this year, and I am so glad I put in the time to think out the details, as it has made it easy to know exactly what needs doing and when without having to think too hard!! We came home from Tenerife on Friday evening, and have spent two days harvesting, digging and sowing, all according to the Master Plan. While were were away, the peas sown in modules at home all germinated, and they are now sitting in the large cloche on #146, where I hope they grow on quickly so I can plant them out. I do need to sort out their supports first though, as they are all very tall varieties. Lots of the sunflowers germinated, and the second sowing of sweetpeas are just popping up their heads. Disappointingly, very few of the pink cosmos grew, although there are plenty of white cupcake ones. 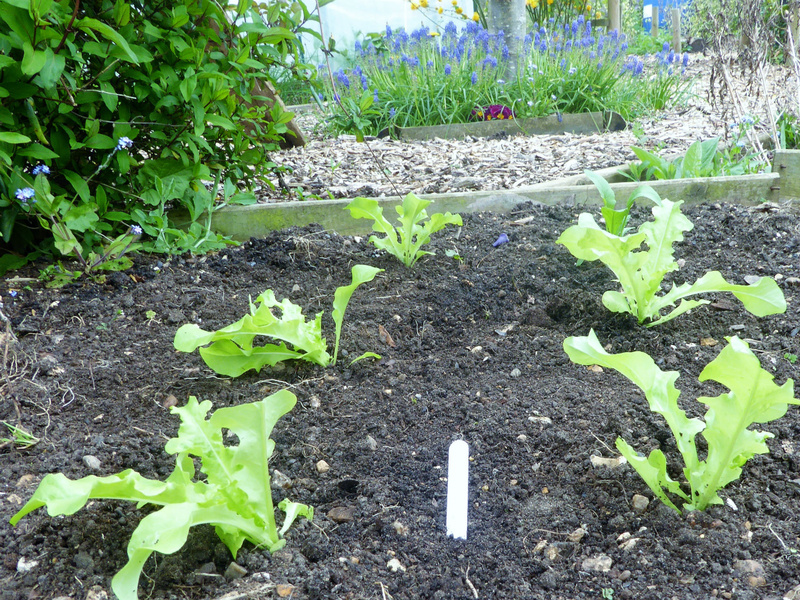 I spotted a few self sown seedlings at the plot this morning so I shall have to nurture these and hope they are pink. There has been a bit of a sowing frenzy here. Tomatoes were first. I really don't know how I am going to house all the seedlings/young plants, but somehow they will have to fit. Maybe by then all the trays of flowers can go into the cold frame. There are some very cold nights forecast in a week's time so they will not be moving just yet though. I have sown some extras for friends and family, more or less as requested, and made a note of what is to whom too.. maybe I can move these on as small plants?? Here is the final selection, in an effort to have a good balance of fruit sizes and colours this year: Green Zebra, Oxheart, Reisetomate, Costoluto Genovese, Summer Cider, Marmande, Moneymaker, Golden Sunrise, Sungella, Rosella, Chocolate Cherry, 11s & 1000s, Kibit's Ukranian, Yellow Pear and Crimson Crush. Crimson Crush stood up well to Late Blight last year, and so will be grown outside, with most of the others being under cover. A friend saved some seed from his plants last year and has generously shared these to see whether this second gerneration from and F1 cross retains this resistance. It'll be interesting to see, so thank you, Mike! Then came the Cucumbers, which are in the propagator on the windowsill: Chinese Slangen and Poona Kheera for outdoors; Picklebush for gherkins, also outside, and Zeina and Diva for the greenhouse, with a single seed of Telegraph Improved that I discovered in what I had thought was an empty packet. 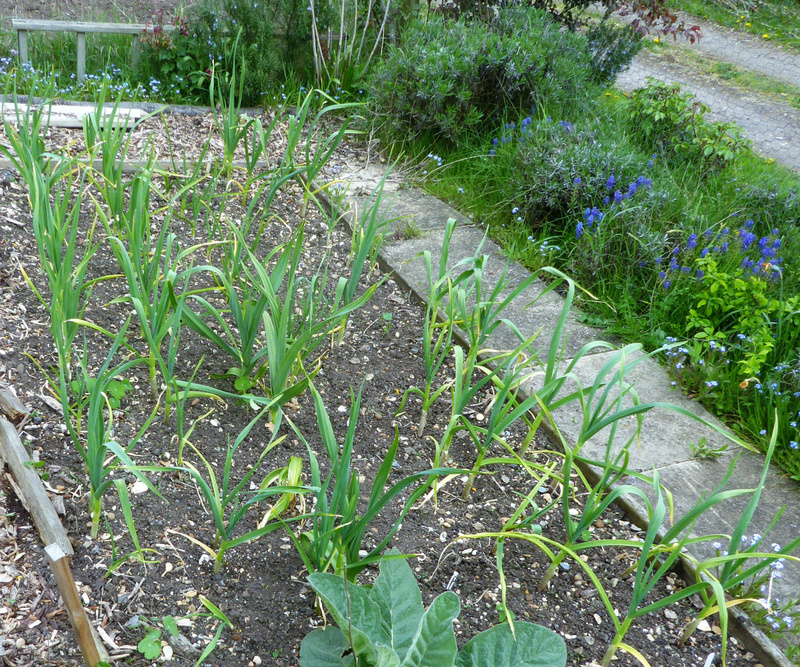 Courgettes joined them. 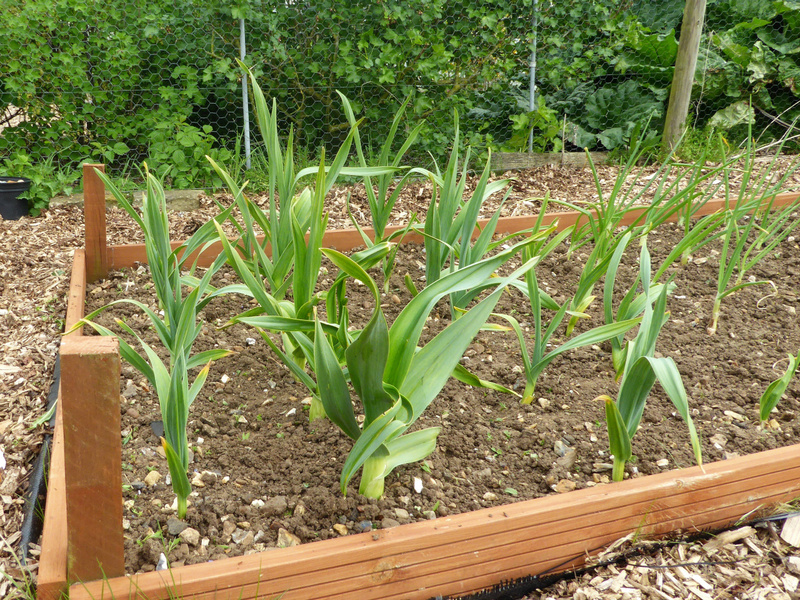 NO pattypans this year after last year's embarrassing excesses: Lungo Bianco, Coucourzella and Sure Thing. This last is parthogenic ie it develops fruits without needed pollination, which is helpful. Two seeds of Giant Bolivian Achocha were planted as the small fruits were actually very tasty last year. 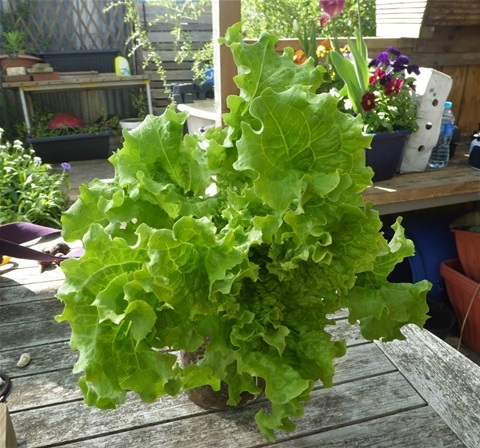 Remember the plan to have a succession of lettuce throughout the Summer? Well, the first six of the Black Seeded Simpsons were planted out this morning and a further six seedlings were transferred to modules to grow on. Hope I can keep it up! 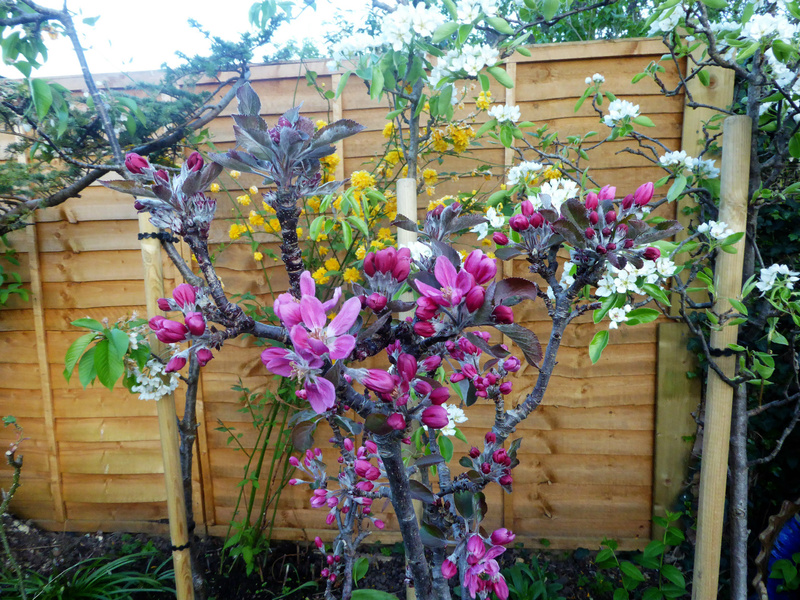 All our fruit trees are covered in blossom. The header photograph shows the Valentine apple trees luscious pink flowers, which have a wonderful scent as well as looking good. The other apples, both at home and at the plot, have beautiful pink and white flowers, the pear trees are snowy white and the damson and plum are also white. 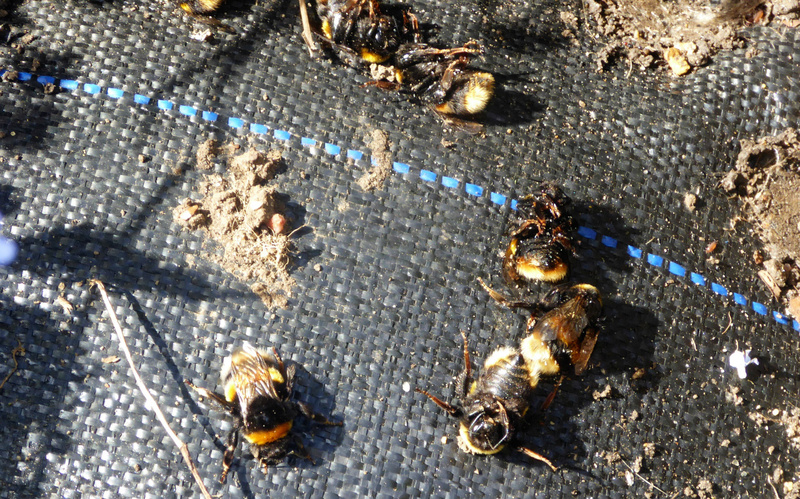 All buzzing with bees, which is great news. The red currant bushes are covered in flowers too, and the summer raspberries, which are escapees from our heavy cull a couple of years back, have developed an enormous number of flower buds. Let's hope they all produce something delicious! Tulips have joined the parade of flowers too. 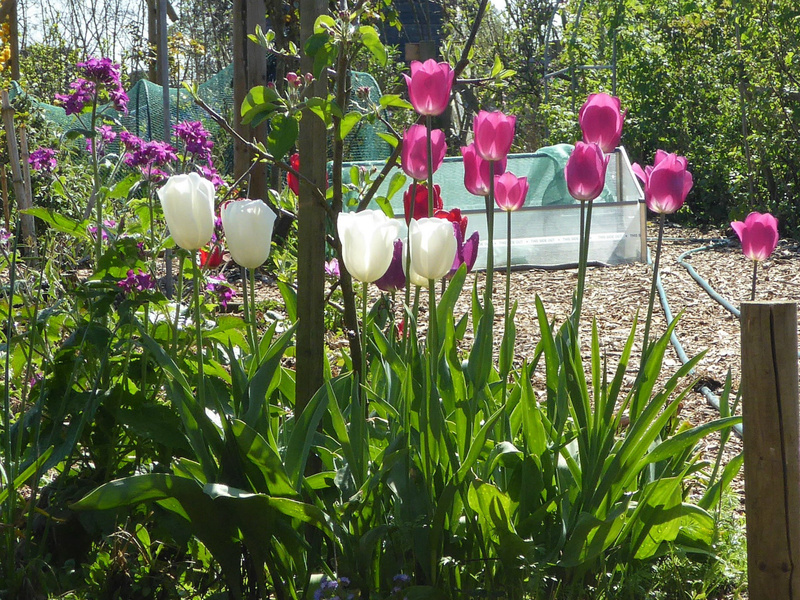 I am always relieved when tulips flower again, as some sem to just fade away, but these are in their second year so hopefully they will be around a while longer. We both worked hard this morning. 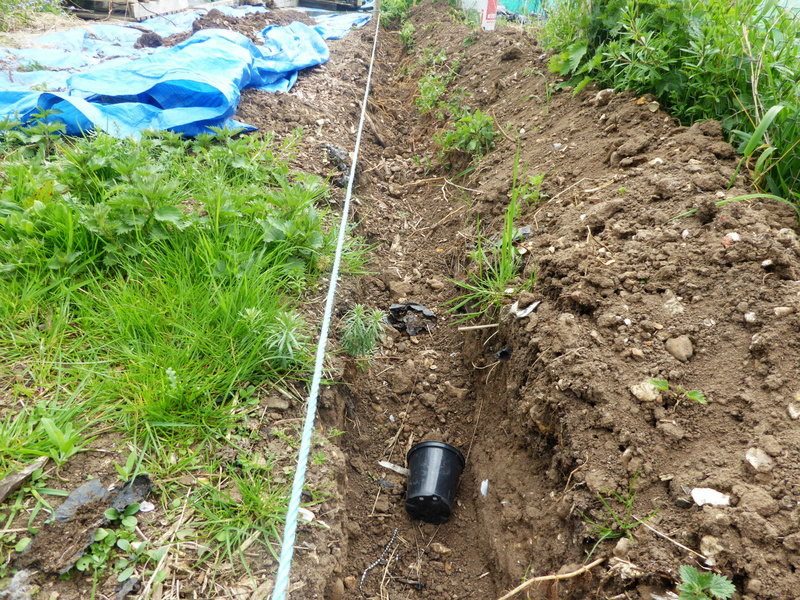 Abi completed the trench for one of the long sides of the new polytunnel. He has decided it is time to order this long-awaited piece of kit, together with ground aanchors and hotspot tape, so tomorrow is the day! OK, so a photo of a weedy, nettle infested trench is not very exciting perhaps, but it represents the start of our new growing opportunties, so, here it is!! 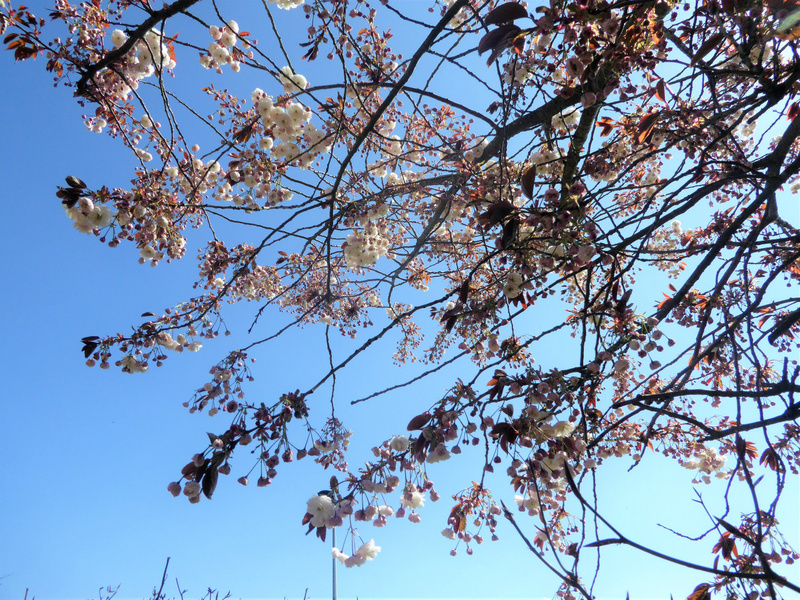 After a back-breaking morning, it was good to stand up straight and stretch a bit, and then gazing upwards, I noticed that the ornamental cherry tree by the gate is now in flower, and what a beautiful sight against the blue of the sky! And that is all for this week, but bearing in mind we have only been back three days it feels we have achieved a fair bit. Hope you have enjoyed reading this again!